With its panoramic views of St Brides Bay, Roch Castle really is the place for romance – so why not escape to Pembrokeshire and indulge in a luxurious 2-night stay and special 6-course tasting menu? They will take care of all the extra touches, all you have to do is book a stay between 13 Feb and 15 Feb. Prices start at £230 per room and £65 per guest for the tasting menu. Situated in the heart of Somerset this super stylish 18th-century Georgian farmhouse is truly is one-of-a-kind. Guests won't want to miss luxuriating in the roll top bath, before heading down to living room complete with wood-burner. What's more, they're offering Cool Places readers a 10% saving for stays in February and March. Prices start from £395 for a 3-night midweek stay. A unique B&B in Cumbria and the heart of the Lake District, the three suites are simply stunning ensembles, with hand-carved beds, huge bathrooms, designer fabrics and rococo touches. This is a top-notch place that you will not want to leave. Prices start at £200 per night. Lose yourself at Magazine Wood, your home-away-from-home on the Norfolk coast – a charming country bed and breakfast that also offers the things we love about a boutique hotel, such as privacy and a high level of service. Talk about the best of both worlds! Price start from £115 a night for a double room with breakfast. Could there be a quirkier place to stay than one of these traditional hand-carved wooden caravans in the heart of the Scottish Borders? Opt for Gitana and Zenaya and take a dip in your very own secret eco hot tub. Soak under the stars with a glass of bubbly – what could be better? Price start at £105 per night. Head to the Maids Head in Norwich and check in to a suite decorated with petals, then pop the cork on a bottle of prosecco. 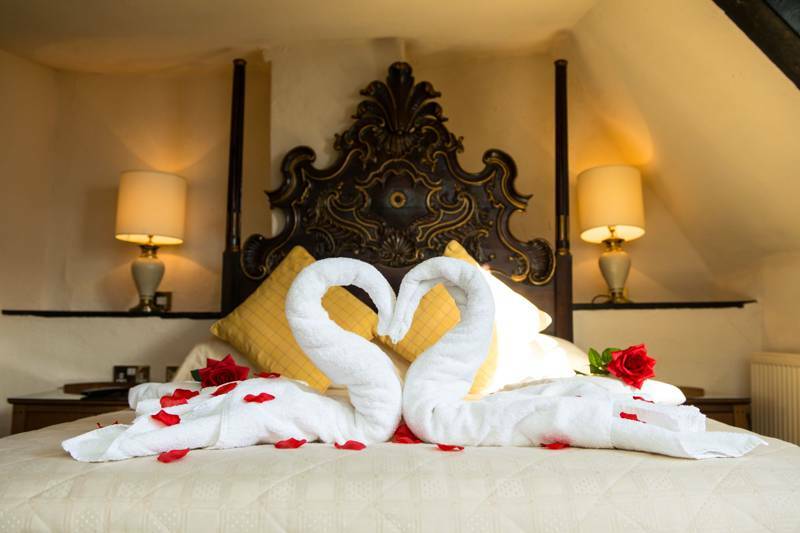 Their £495 for 2 nights offer is valid until November – February isn't the only month to plan a lovely surprise for your loved one! Here you'll find the perfect location for hand-in-hand beach walks and intimate dinners with your significant other. Why not book their 2-night stay and special 6-course meal at on-site restaurant two-rosette Blas. Prices start at £180 per room per night and £65 per guest for the tasting menu – offer valid for 13–15 Feb.
A relaxed hotel on a beautiful Herefordshire estate, Brooks Country House is the perfect place to get away from it all for a few days. And it's affordable too: book a break that includes a delicious 2-course dinner, a bottle of wine and roses on your pillow for just £75 per person. But if a city break is more your thing, opt for their sister property in Bath where a room costs just £99 B&B, and that includes both afternoon tea and prosecco. Book a stay at one of Milsoms wonderful hotels throughout February and enjoy a luxe overnight stay that includes a 3-course dinner, Full English breakfast, plus a bottle of champagne, red rose and chocolates. Prices start at just £115 per person and the offer is available at Milsoms in Dedham, Milsoms Kesgrave Hall and The Pier at Harwich (not valid on 14 Feb itself). A day spa, outdoor pool, hot tub and pool house with open log fire - we're pretty sure Maison Talbooth has all the facilities you could need for a romantic break. During the 'Month of Love', join them for an overnight stay and 4-course tasting dinner at their award-winning restaurant beside the River Stour – prices start at £185 per person and are valid throughout February (excluding 14 Feb).